Users of the platform can mix and match the energy and internet providers they want from a range of providers which BillHub has partnered with – these include energy providers GenRent and Spark Energy, and broadband companies Virgin Media, Plusnet and TenTel. There is also the option to choose a plan through the uSwitch price comparison plug-in. Housemates can sign up to all their utility needs directly through BillHub and agree automatic direct debits or manual payments – putting them in complete control and allowing them to manage everything in one place. If users already have a payment plan with an energy or internet provider, they can simply take a photo of their paper bill, upload it to their Hub and pay online. 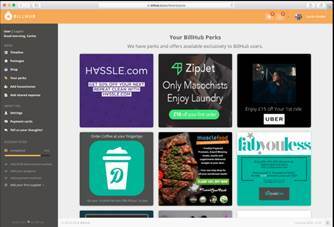 Through the dedicated ‘Perks’ page, BillHub users can also benefit from a range of discounted services with the likes of Uber, Hassle, MyProtein, ZipJet, and MuscleFood.